Last year, my son's school had a leprechaun come into the classroom and make a mess while the kids were on the playground. My son asked if the leprechaun was coming to our house, so course I felt the need to have the leprechaun appear. I luckily had some chocolate gold coins still in the cupboard, and the leprechaun left them on their pillows at nap time. 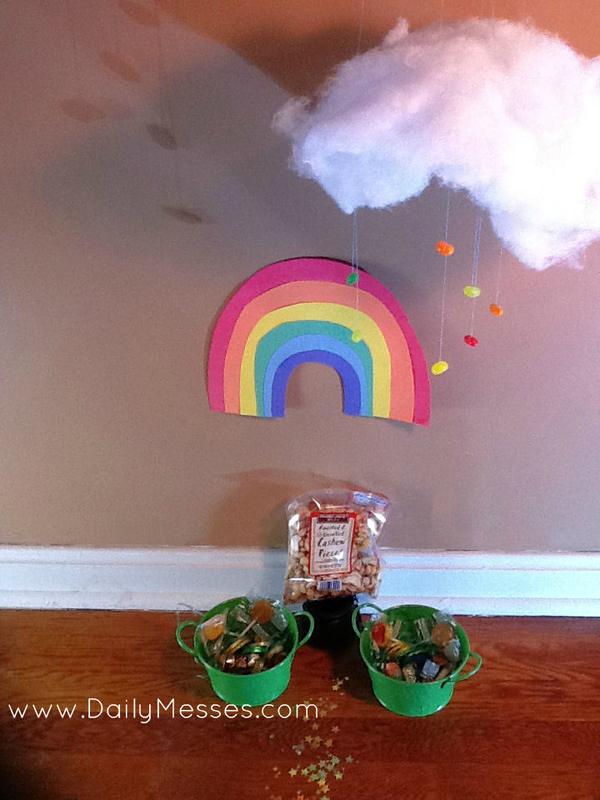 This year, my son wants to make leprechaun trap. I think, that since this leprechaun doesn't really like the mess of making a trap, or getting caught in one, my plan is to leave them a pot of gold (aka gold candies) instead. I made a rainbow out of construction paper and taped it to the wall. I had some little black plastic cauldrons from Halloween and some small green metal pots that will work as the pots. I don't know about you, but after Halloween, St. Nick's and Christmas, we have tons of left over candy. I went through and grabbed out yellow Lifesavers and Starbursts, gold wrapped mini chocolate bars, yellow M&M's, and some yellow suckers to stick in the pots. I did buy a bag of chocolate gold coins ($1 at Target and Party City, or you can get them here). Alright, so I may have went a little overboard. I made a cloud from batting and tied to the curtain rod with thread. I then made jelly bean rain drops, also hung with thread. Lastly, I added in a small trail of star confetti. The two green pots are the candy pots for the kids. The black cauldron pot is for my husband, and I'll add the cashews before he wakes up (I don't want the dog to eat them). **On a side note, the craft below makes a great St. Patrick's Day craft! We made shamrock fingerprint cards, which we were going to send them out to grandmas (which I forgot about and it hasn't happened yet). I brushed on some green paint on their pointer finger and pressed three times onto paper to form a shamrock shape, then painted on a stem. 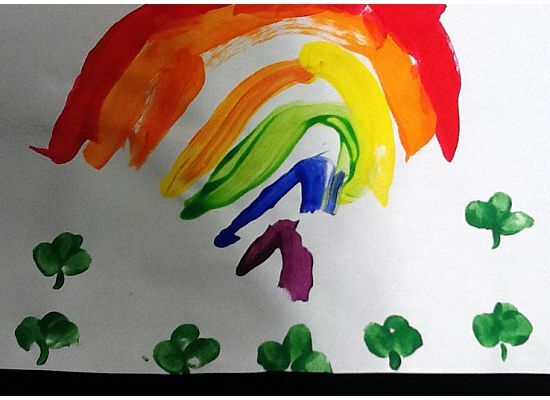 My oldest painted a rainbow on his card. You could also make a potato stamp shamrock to make a card. These are such cute ideas. I teach kindergarten and a leprechaun messed up my room (not me-an administrator! )and the kids really did love it. I love how you are making memories with your boys and that you remember the grandparents!